I’ve never cured my own salmon before. Why would you when it’s much easier to buy it already cured? 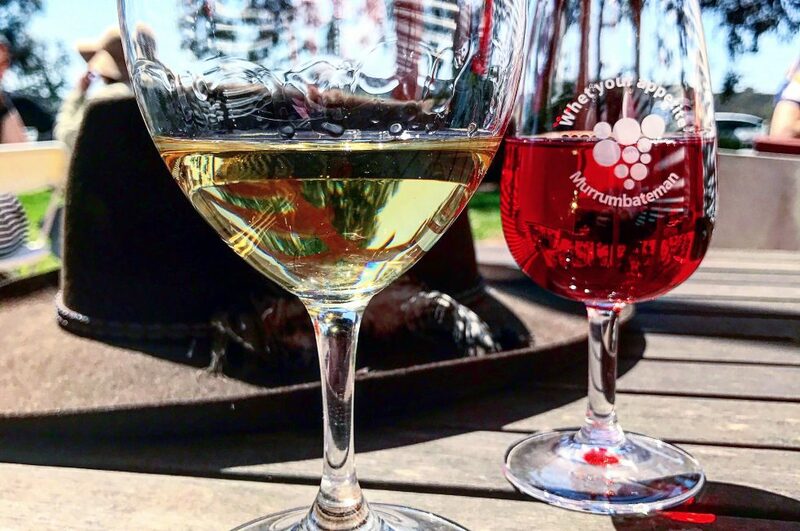 It has always been something I’ve wanted to do, but I usually lack the occasion to do it, dinner parties for me are about cooking the main and/or dessert and buying in pre-prepared hors d’oeuvres. But, as soon as I accepted the 6.5 kg box of blood oranges from Red Belly Citrus I knew I wanted to do a salmon or trout fillet cured in blood oranges. Combined with the fact that I’d just bought some baby beetroots and had a stack of radishes from my garden (the only damn thing to grow out of about 50 winter veg seedlings planted months ago 😦 ), I was pretty excited about what I was about to create. You know the fancy smoked salmon dishes you get in restaurants, always plated beautifully with fresh salad ingredients and tart, tangy dressings to go with; that’s what I wanted to put on a plate. And I think I kind of achieved it. In this recipe I wanted the Red Belly blood oranges to shine, it was about showcasing the fresh, sweet fruits that yield so much juice, with a zest that is fruity but not bitter. It imparts a subtle orange citrus flavour to the items I’ve been cooking, not a stringent tartness that I’ve experienced before. Which is probably why I need to increase the zest in my next batch of cured salmon. The real difference I’ve noticed with the blood oranges and the regular navel oranges I would normally buy, is the amount of juice you get from them, and also the soft, soft, skin and pith. They’re a joy to cook with. 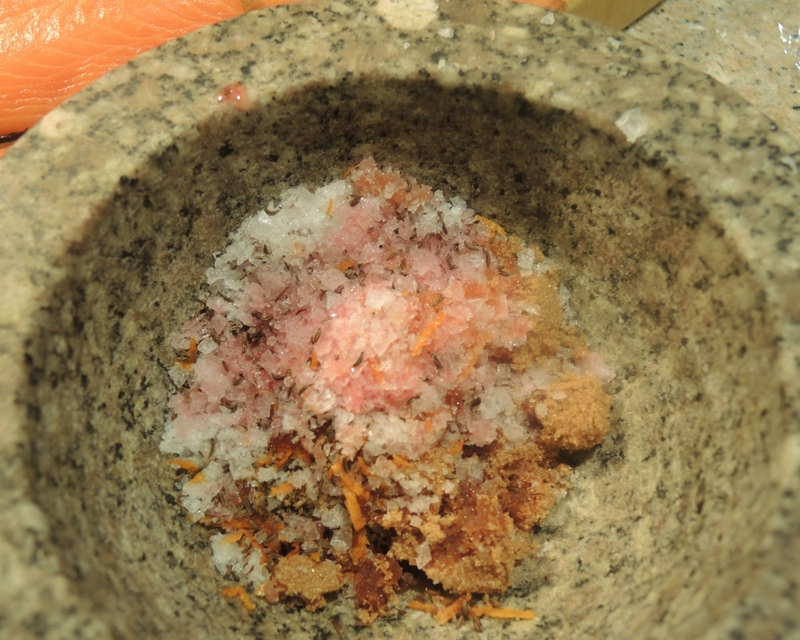 Chuck the ingredients into your mortar and pestle and pound away until all amalgamated. 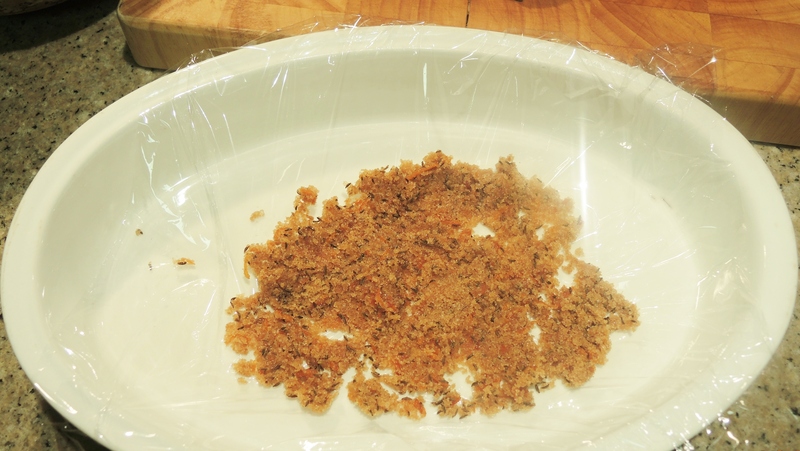 Lay some cling film out on a flattish surface and spread half the mix on the bottom. 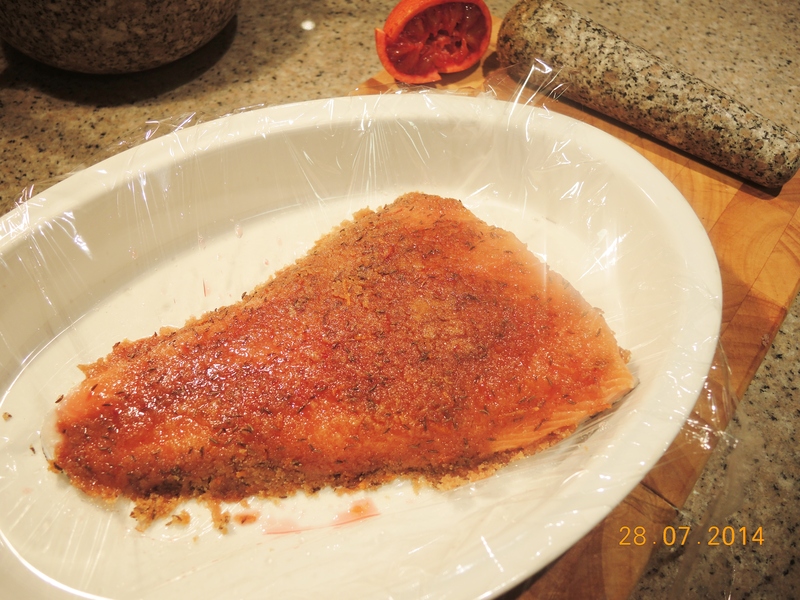 Lay the salmon fillet on top and cover the top with the rest of the curing mix. Rub it all in (with a little more on the thicker end as my tail end became a little like salmon jerky) and give it a good massage, ensuring it’s all covered well. 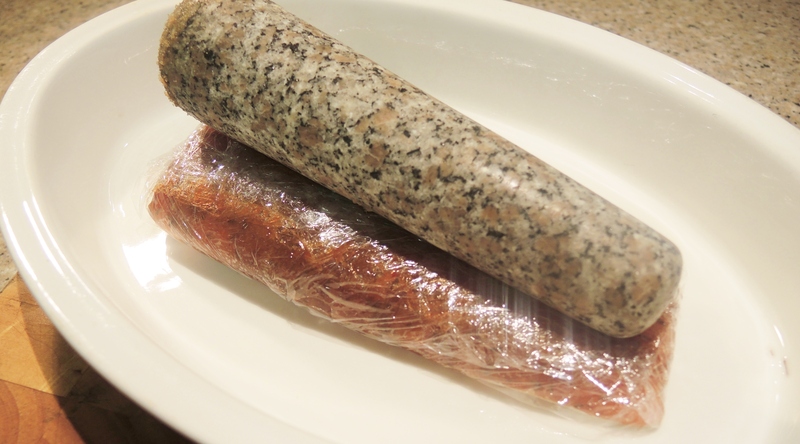 Wrap it up tightly with the cling film, ensuring there are no gaps in the wrap. You want this little beauty to be wrapped up securely like a 5 year olds Christmas present under the tree. Put something heavy on top so the juices cure the salmon, and flip it over a couple of times over the next 48 hours. It comes out like this. It was gelatinous and slimy, and smelt very strongly of caraway, and I thought to myself, those chickens are going to thoroughly enjoy this. But, after giving it a good wash to remove all the curing mix off and patting it dry, it seemed to come good. On eating a slice of this on it’s own, without any of the accompaniments that I had planned, I found it a little too salty and quite strong in caraway. But, when eaten in conjunction with the salad ingredients and the cream and dressing, it was a treat. The saltiness disappeared and what was left was a hint of caraway, a hint of orange zest and a slight saltiness that at first had you thinking you needed to add more salt, but the more you ate the more balanced the flavours became. Slice it on an angle as thin or as thick as you like your salmon. 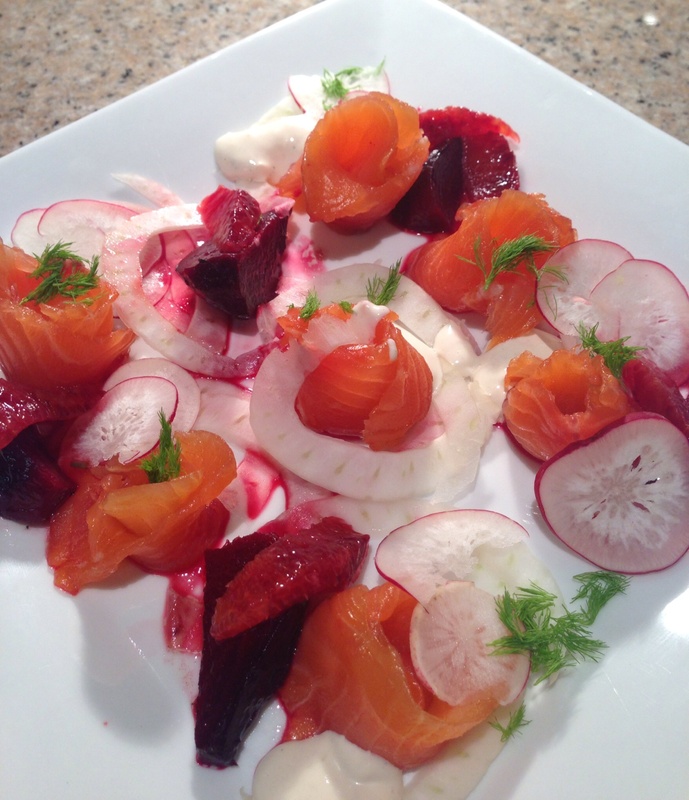 The salad I made for this was a combination of thinly sliced fresh fennel, salad radishes straight from my garden, roasted baby beetroots and blood orange segments. 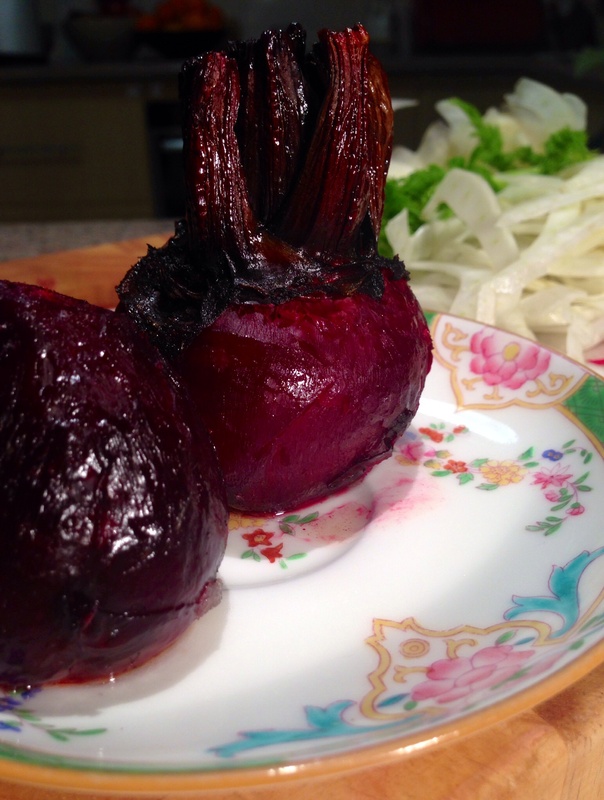 I roasted a couple of baby beets in a 180 oven with some olive oil salt n pepper. When soft enough to pierce through with a knife (roughly an hour and a half, all dependent on your oven and size of beet), remove from the oven and allow to cool a little. Don your surgical gloves (or washing up gloves) and whilst still hot, peel the beet. It’s much easier to do this when still piping hot. If you don’t wear gloves you will end up looking like you’ve murdered someone. Cut into delicate little chunks and pop back into the roasting tray so they soak up the oil and seasoning. I then made a blood orange and honey dressing, just by squeezing out the juice from the leftover segmented orange, (here’s a tip, segment the orange over a bowl so you catch all the precious juices) and a little more juice to taste, a tablespoon and a bit of my Honey Delights honey and a little seasoning. This was whisked together until well mixed and poured into the beetroot tin to coat the beetroot in the orangey honey dressing. If you find it’s a little dry, add more juice, honey and seasoning until the balance is good, you need enough to drizzle artistically over your final dish. I then made a horseradish cream. This consisted of a tablespoon of horseradish cream, 2TBs of sour cream, 1TB of mayo, a dash of blood orange juice to give it a pretty pink tinge and seasoning. Mix until all combined. This is then also plopped artistically over the end dish. When testing the dish on my parents, my dad put in a scant tsp of wasabi powder which gave it a bit of a kick, this worked really well. Arrange the thinly sliced fennel, radish, chunks of dressed beetroot and orange segments artfully on your serving platter. Splodge some horseradish cream around the place and then splash the remaining orange/honey dressing around too. The fennel fronds are most useful in giving some added texture and pretty green bits to the end result. 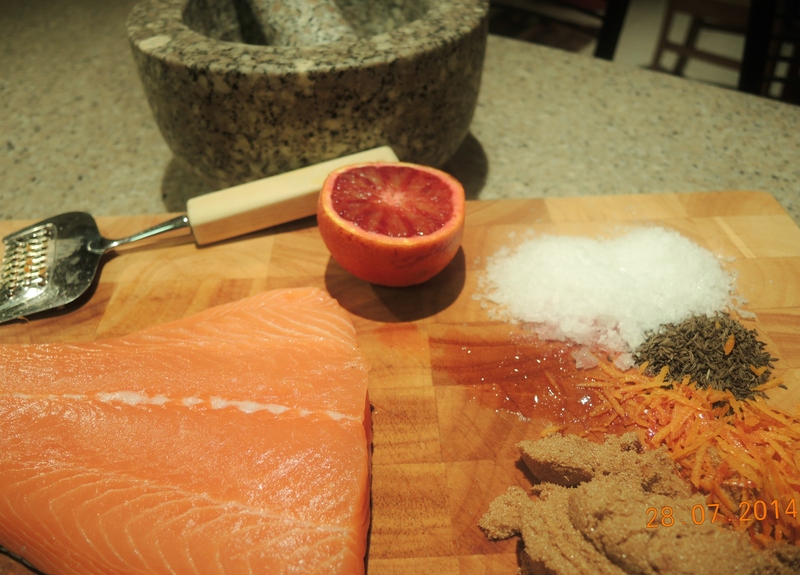 Voila, a restaurant quality dinner for two that is a lovely fresh balance of crunchy, salty, tangy, aniseed, sweet salmon. Wow Fran! I love salmon and this looks really good!!!! Love the colour it changed too! Thanks Rosemarie, it was such fun to make. I rarely do such intricate recipes. Fran, this looks like a wonderful dish! Well done! Thanks Susan, it turned out really well. 😀 It wasn’t half bad.